MONDAY, AUGUST 18, 2008, 10:00 AM. 10 Internet, we have published our results this morning obviously and did an ASX release. There are copies in the room of both the presentation and also the ASX release. 15 the podium, our Chief Financial Officer, and most of the management team of BlueScope Steel in the front here as well. So during the Q&A, I will be trying to flick as many questions to the team as possible. 20 2008. Basically off the back of good steel demand both in export markets and in our domestic markets, and I will talk about that in a little bit more detail. Just to give a sense, we are entering fiscal year 2009 in a similar manner to the one we came out of fiscal year 2008, so still strong demand and continued good performance. 30 killed, but also for all of the employees and contractors at the Steelworks. We had stopped for safety across all of our sites globally. We continue to try and focus so we continue to focus on being as safe as possible with our goal of Zero Harm continuing to be what we are driving towards. 45 basically to improve the safety performance. We have increased our employees by 25%, we are up to 21,000 employees, and we increased dramatically the number of sites. We have people now who are interacting with steel a lot more in the distribution business but in also the downstream businesses that we acquired in the United States. As a company, we will continue to focus on Zero Harm. It is our number one priority. 5 Sustainability is very important for us as a company. It is obviously very important for Australia. It is a real focus in Australia. It is a focus in Asia and a focus in our US operations as well. 10 Australia. We have halved our freshwater usage in our operations at Port Kembla. We have got a project underway to reduce dramatically our freshwater usage at Western Port in Victoria. There is a lot more information on that in the supporting information. We have talked about this in the past. 25 good as any steelmaker in the world in producing steel and minimizing our CO2 equivalent emissions. 35 one of the issues in the Green Paper at the moment. 40 processes to ensure that the government has all of the information they need to make an informed decision when it comes to BlueScope as an emissions-intensive trade-exposed business. 5 have actually released working capital. So our working capital efficiency has improved dramatically. The Board made a decision to increase the final dividend by 1 cent, so in total, our year-on-year dividends are up 2 cents. 10 what is the underlying cash generation and part of that will be a very continued, very strong focus on working capital. The second one is the capital program. Reinvestment in the business and growth. The third one is maintaining the integrity of our balance sheet, which is something that we intend to continue a very robust focus on. 20 employees at steelworks in particular and our Australian operations have really focused on key working capital metrics. We are not where we wanted to be over the next couple of years, but we are certainly well down the path on improving those key metrics. We have made the comment in November of last year that we were going to improve our working capital by $200 million. 5 particularly pleased by the acquisitions that we have made in the United States. 10 shareholders and that is the focus that will continue. Despatches are up over 8 million tonnes from 7.5 million two years ago. Obviously, the distribution/acquisition in Australia has increased our flowthrough of product. But basically, as I probably said this five times already, demand has been good. 25 ever. So if you look at our portfolio of opportunity, if there was to be an increase in residential demand, and I am not forecasting it at any time soon, but I am telling you that it is needed, then we will get some benefit through that at the moment but that is not reflected in our results. 35 again, things continue to be robust in the domestic marketplace. I will talk to the Blueprint in a moment. 45 is as a result of decisions we made on where to move products in the US market that have not been made before our ownership. So there has already been a better than expected outcome there and we see some significant opportunities in cost reductions and efficiency improvement as we bring the Varco Pruden and Butler Buildings businesses together. I will talk to the global steel industry in a moment, but I think it is good news as I talk to that. 15 metrics. There is information here about what we are doing within the blueprint and the rigor around the project management office, and I have mentioned that we have already delivered $100 million of the working capital reductions. 20 So moving forward, it is all about continued focus on the core value drivers of the business, whether that be in Australia, the United States or our Asian businesses. Where we go to next with the blueprint is the focus on the growth and how to be more specific about our growth opportunities. So we will talk to you about that over the coming months. 30 than we expected as well. So I think we have kept you, the market, pretty well informed of our performance, probably done a little bit better than we expected. 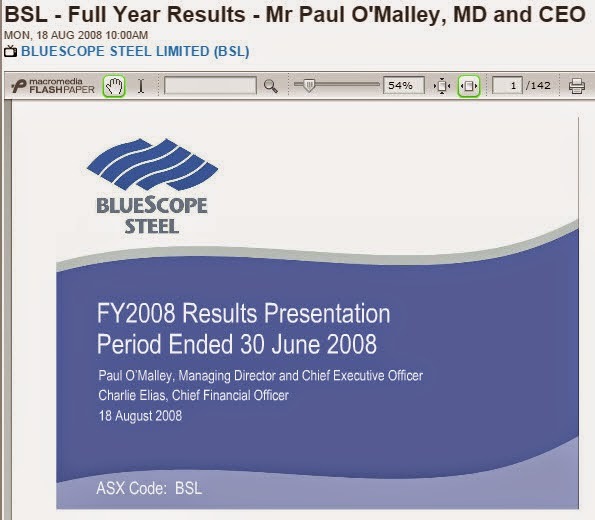 10 longer as with any more product to Steelscape, and up to 1.2 billion in terms of EBIT. 25 raw material costs, when you take alloys and scrap into account, will increase by about $1.6 billion. The pricing environment in the global steel market at the moment is offsetting those cost increases. 40 cents not so long ago, back down to the 80-cent range at the moment. Charlie will talk to the sensitivity to the exchange rates, but we will get some benefit by the drop in exchange rate over the past couple of weeks. 45 have got to manage our costs. We see demand continuing to be quite robust. Specifically, if I just highlight some of the segment performance, I mentioned the production records at Port Kembla Steelworks, slab, hot rolled coil, plate, metal coating, all working well. I need to thank the team for their wonderful performance. 5 months as well. As part of the blueprint, we wanted to focus on our customers, we wanted to meet their demands, we wanted to be responsive to their requirements. What we have seen over the past 12 months is a bit of a structural shift that you would have seen two slides earlier. The mix of sales has moved more to the value added, which is a good thing for our business. 10 So metal coated product in particular but also very strong demand for plate. 35 the CPRS is going to operate. 40 volumes of consumption. So you can work out all of the maps on specific costs for our company. 45 get better insight into the market, having that business. We see some cost reduction opportunities which we have been working through around our sheet and coil processing, particularly in South Australia at this stage, but I think a very good finish to the year in that business. 10 renegotiating our arrangements with our coal suppliers. Cost escalation in mining is actually going to flow through to our coal cost in 2009. 45 moment because they cannot meet their own internal demand. The government has put restrictions on exports, but they have also put price caps on domestic sales, which is making it hard for exporters to send products to India at the moment. So I am not sure how that is going to play out, but we still see strong demand, just an interesting one as to what is happening in the Indian market at the moment. 5 about spreads. I would mention at the Castrip business, Nucor is into development of its second line and its first Castrip line is producing products and selling it at a profit. So we are looking at the Castrip joint venture as something that we really need to turn up the heat in terms of commercialising that technology. 15 opportunity to rationalize, and we are actually learning from the integration as we speak. So there are some opportunities that we have seen coming out of the businesses in North America as we put them together that we are actually going to move across to Asia as well, so a very exciting opportunity. 30 deliver on the synergies that we have committed to. 45 BRIC economies. So any concern about the July gross exports I think is a hiccup rather than a trend. 10 that there is a post-Olympic effect in China, which is something that one worries about, it has certainly happened in Sydney, it happened in Seoul in South Korea, you still got Brazil, Russia, and India going flat out, so just to put that in perspective. 15 I would now like to hand over to Charlie just to take you through the financial results. 25 $1.6 billion, a result of three factors predominantly, increased prices for our exports, the acquisitions of IMSA, BlueScope distribution and HCI and increased volumes across all our regions. Pleasingly, our second half performance in 2008 is up 60% on the first half providing a momentum into the first half of 2009. 40 the supporting information attached. Further details are actually on this next slide, with respect to both net profit after tax and earnings per share. 45 business and applied to maintaining a target capital structure. 2008 has been no exception. A very strong operations results have seen operating cash flow increase by 16% to 1.65 billion with over 1 billion generated in the second half alone. Further, working capital has reduced, notwithstanding a 1.6 billion increase in revenue, consolidation of the acquisitions and the challenges of rising steel prices and raw material costs. Pleasingly, year-end gearing is up only 2% on fiscal year 2007, although 2 billion was reinvested in the acquisition growth and capital expenditure of the 2 billion, 1.6 billion related to M&A growth. 10 February 2008. Gearing has reduced 10 percentage points on the back of strong operating cash flows and working capital management in the last five months. Today, as part of the blueprint initiatives, we have released over $100 million in working capital out of a target improvement of 200 million, 12 months ahead of plan. 30 plant within the continued focus of maintaining a strong balance sheet and solid capital structure. A strong balance sheet is not only vital in the current credit market environment, but gives BlueScope the financial flexibility to be opportunistic with respect to acquisitions should they arise. 10 changes the sensitivity to 74 million from the 90 million in 2008. Full details of the impact of the reline in the second half 2009 were discussed with the analysts at the Port Kembla site visit earlier this year and the full details included on our web site and the supporting information attached to the presentation. I will now hand it back to Paul to summarize and provide an outlook for fiscal year 2009. 20 a big factor in the second half. The team had done all of the planning that one could ask of them. They continue to monitor the operations at the blast furnace. But it will impact our despatches in the second half. 25 excellent operation performance, record output across many facilities, very strong demand for our product in both domestic and export markets, continued tightness of supply and demand in steel, gearing at the bottom end of our optimal range, the acquisition is on track, and blueprint projects very much a focus of where we are going to go in the business. 40 have had strong demand over the past six months or the next six months. It is a bit hard to see beyond six months, but the business is looking quite strong - well actually the business is looking strong at the moment. 45 second half, two major capital projects, and we have got to deliver on the synergies, and that work is well and truly underway. So on that note, I would like to thank you all for coming. I would like to thank everyone within BlueScope for delivering a very good year, acknowledging that we did have a fatality which, when it comes to Zero Harm, that is about the worst thing that could happen and it has been a tough time for everyone at the steelworks. But we look forward to a safer 2009 and also a good performance into 2009 as well. So I will hand it over now to all of you out there to ask questions. BSL Sorry, Mike. Could just say that one again? 20 through why that business turned around so quickly. 30 driving that? Still very strong demand, certainly higher input cost. So the cost to making steel is certainly going up, but I think it is basically the changes around the margin mark. It is the way I see it at the moment. 45 the Australian dollar-US dollar exchange rate which is the predominant exposure in our business. BSL I think it is US $25 at that time. BSL Ninety cents or so. 5 based on your guidance that you gave in May, a pretty strong fourth quarter as well. I wonder if you can give us an update on the challenge of passing through those high costs. 10 business, I guess. If you look at the back of the presentation, we provided waterfalls as well (inaudible) (0:43:04) so there is detail there. Still very strong demand in the market place for the products coming through that business, what tended to be hot rolled coil, metal and metallic coated and painted. The commodity products, there has been very strong demand for those products. 20 those costs so there is absolutely margin squeeze in that part of the business. Q Are you pushing through price rises in that business? 30 requirements and be sensitive to price. But our cost structure is increasing dramatically and we would not be doing our job right if we were not trying to recover those costs. Paul, do you have anything to add? 45 week. Many of you will have worked with Brian while he was CFO and then President at Australian Manufacturing Markets and running North America. He has done a fantastic job for that company. We are going to miss him a lot. I think we have got a very good management team so I am sure we will get by, but he gives us plenty of advice and we will probably take that. If you get a chance to say goodbye to him on the way out of the door, he is certainly going to miss me amongst us and we are going to miss him. I just thought I would throw that in. 15 can give us an update in terms of the sort of interest cost that you are expecting. 40 think you will see the PEB business continue to improve and Lysaght will certainly come up. BSL Emily, in relation to the interest cost, we did face increased margins that you would expect in this environment. I mean, we refinanced predominately consistently with our previous terms and conditions and covenants. 45 Essentially, cost or basis point was up about 40 to 50 basis points. If you take the 50 basis point-spread sensitivity, you are looking at a $4 million impact on NPAT. BSL I think we have got a question on the line. Operator Next question if from Michael Slifirski of Credit Suisse. Please go ahead, Michael. 10 of that is a permanent change versus how much is just the constraint, tight global steel market? And what would you say, expect, perhaps longer term, that you might give up if steel availability improves? BSL Michael, I am going to ask the President of our North American business, Mark Vassella, to answer that question. 25 able to take that as increased share through distribution. 30 highest yield prices on average, or higher raw material cost on average? 35 material’s impact on inventory is likely to see the working capital go up. Q How would we estimate that impact, Charlie? BSL Michael, I think what I will do on that is, we will look at getting back to you with an answer later. Operator Thank you. The next question is from Andrew Gibson from Goldman Sachs JBWere. Please go ahead, Andrew. 45 Q Hi, guys. Just again on that working capital question. I think previously your guidance was 200 million cash benefit from working cap and asset sales so you are guiding towards 100 million additional working cap benefit in 2009. Is it cash from asset sales that come out in addition to that? That is question number one. Question number two, how much coke sales were achieved in the second half or the full year and what you are expecting 2009 on top of those two things? 15 guess in 2008, there were 264,000 tonnes of coke sales. Did you have another question on coke sales, Andrew? Q No. Just if you could provide any guidance as to what we should expect in 2009. 20 BSL It is opportunistic. We will have spare capacity in the second half, but in terms of the actual commitment, it is a bit hard to say because, notwithstanding indexes and the like, it is really a shipment by shipment negotiation and it really will be opportunistic. 30 took advantage of the monopoly in Australia over the last six months’ period? 45 who have relied on other supplies to the extent that those supplies are not supplying them, we will try if we have got extra capacity, but if we do not have extra capacity, we are not in a position to supply them. I think it is a very competitive market. Some supplies are less reliable than others. I would say that we are a very reliable supplier, but it is a competitive market. Q Okay. Just finally, to confirm an earlier point, your comment on non-res, were you saying that you think the outlook for the next six months is still pretty robust, non-res specifically? 5 increasing steel, but also in the entertainment sector, there has been an increase in sales or demand for product into the entertainment sector which is an interesting one. So, residential is absolutely flat, but the broad-based demand outside residential is still pretty strong. Operator Thank you. There are no further questions from the phone lines at this time. 20 Asia, in the result, with the rise of the steel prices through the half, when you cut the books off at the end of June, was there a positive impact from inventory adjustment from that? And if so, how much? 30 four months out and it is still reasonably strong. BSL Just in relation to capital expenditure, there is actually more details in the supporting information we have provided on about Page 134. BSL You might not have gotten to that page yet, Craig. 40 must have earned about $300 million plus in the fourth quarter of 2008? Is that correct? 5 remains strong. Pricing is strong, cost is going up. The prices at the moment are covering cost particularly as a result of the strong export. Q Okay. You are in the process at the moment of negotiating the semi-quarter pricing, is that right? 10 BSL Yes. Over the next four to six weeks, we will have the semi-quarter pricing locked up and it still remains reasonably strong or strong. BSL I would like to be bit a conservative. BSL I think there is a question on the phone line? Operator Thank you. The next question is from Andrew Gibson of Goldman Sachs JBWere. Please go ahead, Andrew. 25 in the short tern? Then, just finally tax. Can you give us a feel for the effective tax rate into 2009? 45 about the tax rate. BSL So, Andrew, in relation to the tax rate, you will note in our earnings release that our effective tax rate was actually up in 2008 to about 34%. But if you take the underlying, and that is because the impairment is being sort of permanent difference if you will for tax purposes, if you reverse that back out, we would back down to an effective tax rate of just over 30% or thereabouts. Q (Inaudible) (1:02:41) similar in 2009. 5 BSL Yes. It will come back to the mix of earnings. The tax rates in the US are a bit higher and the tax rates in Asia is a bit lower, so it has been to the mix of those. Q Are there funky things we need to think about? 10 BSL No. We try to keep funky out of it, Andrew. Q That is good. Thanks. Operator Thank you. There are no further questions from the phone line at this time. 15 Q Hi, (Inaudible) (1:03:06) still from UBS. Just a quick question on the growth. I mean, where do you see the growth from the company? Is it upstream, downstream, is it domestically, internationally and maybe what regions are you possibly focusing on? 35 aging No. 5 furnace is relined. 45 the West Coast. So, if you think about the Unites States, we are 1 million plus producer and consumer of steel in a market that is about 120 million to 130 million tonnes. So we are not going to be (inaudible) (1:05:33) in that market, but even if demand was to slow down in the United States, given where their exchange rate is, import is slowing down more quickly than demand is slowing down, and import is slowing down more quickly than both demand and also when you throw exports into the mix, you are actually still seeing a very robust steel price environment in the United States. 10 bullish in any type of economic situation in the US that we can build a really scalable business there. 30 certainly look at participating in those opportunities. I think we have got another question on the phone line. 40 because of the tonnage pull-through. I guess if you look at a lot of your major competitors, they are going one step further. They are taking the profit upstream in raw materials. What are the implications at a longer term if they start being happy to take profit up there? Does that compromise what then becomes for them the midstream and your upstream? 45 BSL I guess you are talking about the profit result that will come after the market closes today, Michael. 20 price. It is pretty hard to find anything at the right price at the moment. We have got a process in place to ensure that we maintain security of supply for raw materials for our businesses, that we maintain a quality that we need and that we maintain our competitive price advantage. So, there are three things that we are focused on. I think we are focused on quite well. 25 Opportunistically, if there is something out there, it would have to stand on its own two feet. They would have to meet our return on invested capital targets. It would be hard to see something like that at the moment, but one never knows. 30 Q Thank you. Then, secondly, back to Asia, when you finished, did you organize -- you have got your capacity up and your capacity utilization up and got margins to where you think you can get them. What sort of EBIT can Asia generate do you think? BSL I think that might be it in terms of questions. So I would like to thank you -- unless there are any more -- I would like to thank you all for your time and if you have any follow-up questions feel free to give (inaudible) (1:11:52) a call. He says he is fine with it. Thank you very much.